I kind of just made this up one morning before I went to the gym, but I have to say it’s a definite keeper. For this particular interval workout, I wish I’d had a yoga block, but I guess I can add that to my exercise equipment wish list. For those of you who aren’t serious yogi’s with yoga blocks just laying around, you can use a book or a light weight dumbbell (like me) to squeeze, while you do your wall ball squats! Also for the chest presses with the resistance band, remember to alternate which foot is forward for each round – think odd rounds are right, even rounds are left. And before I describe the workout, can we have a moment for how many times I seem to make this awesome bug-eye face when I am trying to just look normal. I wonder if I do this even without a camera pointing at me?? Moving on. 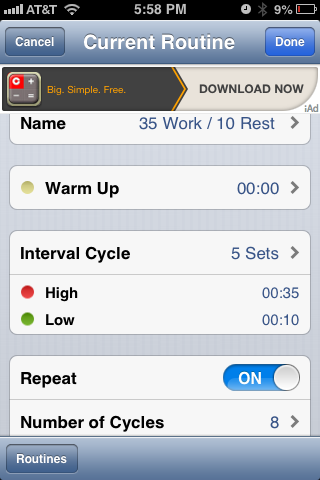 set the repeat option to “ON” for 8 cycles. Each round is 3 min 45 sec round. You can pause your Interval Timer and take a quick drink of water and then quickly get going onto the next round. Wall Ball Squats with Adduction: Hold a Physio/Stability ball behind you and stand so that the ball is pinned between your back and the wall. Place your feet about 2 feet in front of your body, so that when you squat your knees do not extend past your toes. Keeping your back in contact with the ball, lower your body (aka squat down) while squeezing your thighs together to hold your yoga block in place. You should aim to lower yourself until your upper thighs are at least parallel to the floor. Rows with Resistance Band: Attach two handle grips and secure the band at or just below mid-chest height and grab a handle in each hand. You can use a stair banister or door handle. Stand facing where you’ve secured your band, feet hip-distance apart, then sit your hips back and allow your knees to be soft (slightly bent). Bend your elbows to row the handles to the sides of your chest, squeezing your shoulder blades together as you pull back. Also be careful not to let your head protrude forward while you perform this move to avoid strain on your upper back and neck muscles. Chest Press with Resistance Band: Same deal with the placement and securing of your resistance band, except this time stand facing away from where you’ve secured your band. Holding a handle in each hand in front of shoulders. Elbows bent and parallel with the floor, palms facing the floor. Step forward with one foot so that you’re in a lunge position. Maintain a slight bend in the knee of your front leg (remember to alternate which leg is forward each round – think odd rounds are right, even rounds are left). “Punch” both arms straight out in front of your chest, keeping your arms parallel to the floot. Bend elbows to return to starting position. That is one rep. Alternating Single-Arm Kettlebell Swings: With one hand, with an overhand grip hold a kettlebell (or dumbbell) in front of you . Bend at your hips and knees and lower your torso until it forms about a 45-degree angle to the floor. Swing the kettlebell between your legs. Keeping the arm holding the kettlebell straight, thrust your hips forward, straighten your knees, and swing the kettlebell up overhead as you rise to standing position. As you squat back down exchange the kettlebell to your other hand on the down-swing. This can take some coordination but I promise it’s a lot easier performed than it is written out. This movement should be fluid and is driven by the hinging of your hips. You should be squeezing your glutes together as you thrust your hips forwards. This is what creates the momentum of the swing. Swing the weight back and forth with fluid force. Inchworms: Stand tall with your legs straight and bend over and touch the floor. Keeping your legs straight, walk your hands forward as far as you can without letting your hips sag. Then take tiny steps to walk your feet back to your hands. That’s one rep. Discovered any new moves recently that you love? Lay it on me! Looks like a great workout! I wonder if they have a similar app for BlackBerry, it’d be awesome to have it for my Tabata workouts. Hey Olena! I wouldn’t want to leave all you android users hanging so I looked into it for ya and found the My Interval Timer app had positive reviews! Seriously having a timer has made the BIGGEST difference ever in my workouts! You’ll love it! Unfortunately the free interval timer apps I came across for BlackBerry didn’t have great reviews…like the A HIIT Interval Timer app but it could be worth checking out! Let me know what you think of the workout! !